Looking for some sweet treats to make this Valentine's Day? Try these flamingo doughnuts, fortune cookies and brioche strawberry swirl sweet rolls. There is no better time to indulge your sweet tooth than Valentine's Day. Food blogger, Landi Govender, has been whipping up some delicious recipes during the "month of love". They not only taste good but also look great! 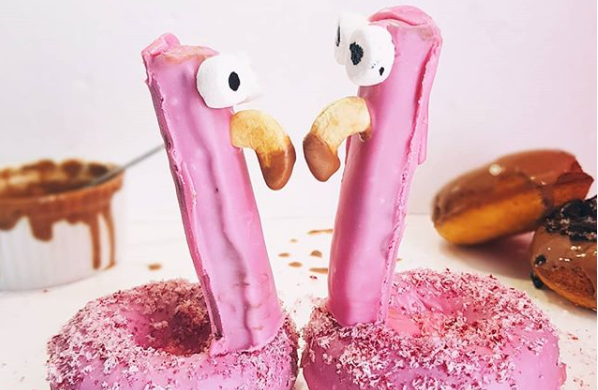 "I made these gorgeous 'Love Birds' aka flamingo floaties with a bit of chocolate ganache, pink coloured coconut, mini marshmallows and two chomp chocolates, and don’t worry about making your own doughnuts just buy them! TIME SAVER! And a really cute gift idea for the kids or anyone really, I mean they’re so frikken cute," says Landi. 1. Dip the chomp bars into the pink chocolate ganache and allow to set. 2. Take one cashew and dip the tip into melted milk chocolate. Place each cashew on one of the chomp bars. Add the white mini marshmallows for the eyes and a drop of black food colouring on each. 3. Mix together coconut flakes and pink food colouring for pink “feathers.” Place on top of the pink doughnut. Place the dried chomp inside the doughnut hole, secure with a toothpick if need be. "Valentine's is pretty special but only because it’s when my husband and I shared our first date back in 2015. It took a lot of persistence from his side because I’ve never ever been into celebrating and I still remember feeling so awkward when he handed me a heart-shaped box of chocolates. Anyway, it all turned out good and this year we’ll be celebrating our 3rd wedding anniversary. "I tried my hand at making fortune cookies because of our love of Asian food, they’re super cute and the best part is being able to attach personalized fortunes inside," says Landi. 1. Preheat the oven to 220˚C. 2. Add the egg whites and vanilla essence to a bowl and use a whisk to beat until frothy. 3. Sift in the flour, sugar, and salt through a sieve. 4. Using a spatula, gently incorporate into the batter. 5. Add the water, 1 tablespoon at a time, until the batter is smooth and falls into ribbons. 6. Place 1 tablespoon of batter onto a baking tray lined with baking paper or baking spray and spread into a 7cm circle. 7. Repeat with another tablespoon of batter, making sure to only bake 2 circles at a time. 8. Bake for 8 minutes, until the edges become golden brown. 9. Work quickly, use a spatula to remove the cookies from the pan. Add a fortune in the middle, fold the cookies in half, then place the flat side on the lip of a cup, folding the edges down into a fortune cookie shape. Place the folded fortune cookies in a muffin tin until cooled to retain their shape. "Now this is what I consider to be the most perfect breakfast. These were so fun to make and so incredible to eat. What I love about these sweet rolls is that you can use any jam or preserves you have on hand and they’d turn out amazing!" says Landi. "These rolls are best enjoyed warm. I topped mine with heart shaped sprinkles given its February and all. I used my brioche dough recipe which I also used to make my Nutella babka." 1. Make the dough: Heat 1 cup of milk to about 35°C. You can use the microwave or stovetop. Pour the warm milk into the bowl of an electric stand mixer fitted with the dough hook attachment (or you can use a handheld mixer or no mixer, but a stand mixer is ideal). Manually whisk in the yeast and 2 teaspoons of the granulated sugar. Cover the bowl with a clean towel. The mixture should be frothy and foamy after 5 minutes. 2. On low speed, beat in the remaining sugar and the softened butter until butter is slightly broken up. Next beat in 1 whole egg plus 1 egg yolk (reserve the egg white) and the salt. The butter won’t really be mixing in, so don’t be alarmed if it stays in pieces. On low speed, gradually add the flour. Once it is all added, beat on medium speed until a soft dough forms, about 1 minute. 3. Increase speed to medium-high and beat until the dough is soft and supple and pulls away from the sides of the bowl, about 6 minutes. If you do not have a stand mixer with a dough hook attachment, knead the dough by hand in this step. 4. Turn it out onto a lightly floured surface and form into a ball. Place into a large greased bowl, turning once to grease the top. (I just use the same mixing bowl that I made the dough in– remove the dough, grease it with nonstick spray or olive oil, put the dough back in.) Cover the bowl with plastic wrap and place it in a warm environment to rise until doubled, about 90 minutes. 5. Once doubled in size, punch down the dough to release any air bubbles. Remove dough from the bowl and turn it out onto a lightly floured surface. Punch down again to release any more air bubbles if needed. Using a sharp knife or dough scraper, cut dough in half. Work with only half of the dough at a time. Place a clean towel over the dough you aren’t working with. 6. Generously grease a baking pan. 7. Roll into a 12×18 inch rectangle. I used a ruler for accuracy. Make sure the dough is smooth and evenly thick, even at the corners. 8. Spread the strawberry jam evenly over the dough. Tightly roll up the dough to form a log. Cut into 8 even rolls. Arrange them in the prepared baking pan, cut sides up. And allow to rise for 30 minutes. 9. After the rolls have risen, preheat the oven to 210 degrees. Bake for about 25 minutes, until they are golden. Transfer the pan to a cooling rack for about 15 minutes. Make The Glaze: In a small bowl, whisk icing sugar and cream until smooth. Add more sugar or cream, depending how thick you want the glaze. Pour glaze over the rolls and serve warm. Cover rolls and store at room temperature for up to 2-3 days. Follow The Tocka Blog for more tasty recipes. ThriveIN helps women access the content they love, engage with other like-minded women, get expert help, find great deals, & make their life easier.